Kowloon Tong station (Exit A2). Walk towards Waterloo Road and turn left. Walk towards Junction Road (big intersection with crosswalk) and turn right. 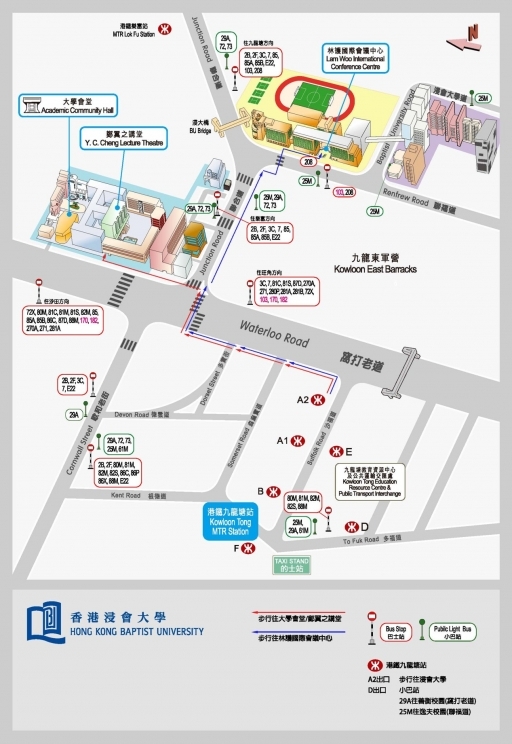 Walk up Junction Road until you see the HKBU entrance at the intersection of Renfrew Road. Cross the road towards Renfrew Road (alongside the HKBU building) and keep to the left side of the road. Keep walking until you see Lam Woo International Conference Centre on your left. Kowloon Tong MTR Station (Exit F). Hail a taxi at the taxi stand, and tell the driver to go to Lam Woo International Conference Centre, Hong Kong Baptist University. To Shaw Campus and Baptist University Road Campus: 25M/25MS (Exit D of Kowloon Tong MTR Station) – Tell the driver that you want to get off at Academic and Administration Building, HKBU. Once you get off, walk forward towards Renfrew Road. Turn right and keep on the right side of the road. Walk up until you see Lam Woo International Conference Centre on your right. Should you wish to drive to Lam Woo International Conference Centre, please contact Miss Man Yi Ma at mamanyi@hkbu.edu.hk to reserve a parking space.